Registration for the 2018-2019 training year is now CLOSED (unless prior arrangements were made to register at a later date). Unfortunately, due to space constraints in our training facilities, registration for this training year is now closed. We apologize for any disappointment caused and encourage you to contact one of the other air cadet squadrons in Brampton (listed below). 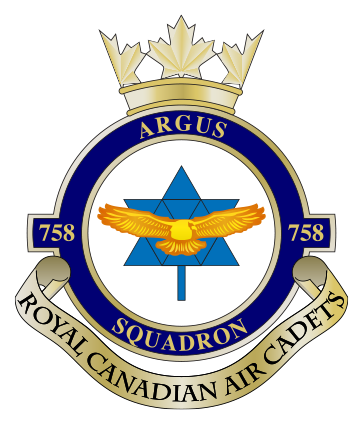 If you are currently a cadet at another unit and would like to transfer in to 758, we will accept transfers at any point in the training year. Just contact us to advise. Drop off is at 1830 hrs (6:30pm) at Lions Hall and pick up is at 2130hrs (9:30pm). Dress will be civilian clothing, Black pants and shoes, White collared top. Bring a pen, small note book, no backpacks. Refreshments can be purchased at the Canteen (if desired). Existing cadets are automatically registered for the next training year but should review the Fees page on this website as there are annual fees to be paid on the first night back and the fees have changed! It’s almost that time of year again! Time to dust of those parade boots and return to another fun-filled training year. We hope everyone had a great summer and those who attended summer training are ready to return to share the information they learned. First Night Back – Monday, September 10. CO’s parade and admin night. If you weren’t able to swing by during the new cadet registration nights to pay your Annual Assessment Fee and Lottery Tickets, they are due on September 18th. More info on fees here. Training – The Training Calendar for the year has been updated online, the calendar is always a work in progress. Please check back regularly for updates and listen to announcements on the parade square. Start thinking about what teams or clubs you want to be a part of! Permission form for the Fall FTX – Sep 21-23 is also live and can be found here. They are due on September 17th, however space is limited so the earlier they are submitted, the better. Uniform Issues – if you need any uniform parts exchanged, be sure to have it with you ready to exchange. No appointment necessary. If you have an issue, just come on by on Monday nights from 1830-2115 and we’ll help you out. Bring back the part you want to exchange (cleaned please!) and we’ll either exchange on the spot if we have what you need or order you a new one.